The European aviation market is a highly competitive space, with airplanes continually looking for ways to streamline their operations, including by optimizing their core IT systems to be as fast as possible. This was the situation for one transatlantic carrier, which was looking to accelerate their aircraft maintenance report, used by its engineering team. The company was looking for a way to find out whether a new SAN, which hosted its databases, would deliver the required performance increases – but that would cost at least $250K, and likely require a lot of installation headaches. Instead, the airliner installed the Method R Workbench. 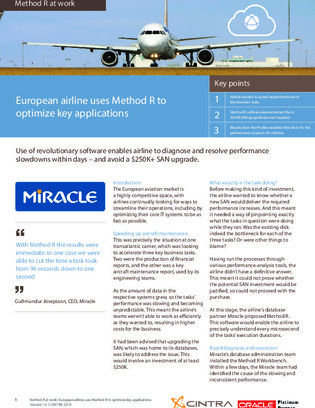 In this white paper, learn how the airline used Method R to precisely understand every microsecond of the tasks’ execution durations.